In addition to these base types, Admins may create additional Custom Contact Types as needed. Simply navigate to the Settings menu, select the Data Customization tab, and then click on Manage Contact Types. 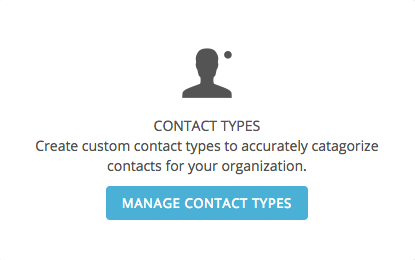 Select a base Type; each Custom Contact Type will be a subtype of one of the three base Contact Types. Then, enter a name for your new Custom Contact Type and click Save. One created, Custom Contact Types may not be deleted. Simply edit a Custom Type and disable it if it is no longer needed.